All transactions are safe and secure with a reliable history in online purchasing behind each of our associates. Buy the Monty Python Quotes t-shirt to own Monty Python clothing and merchandise. 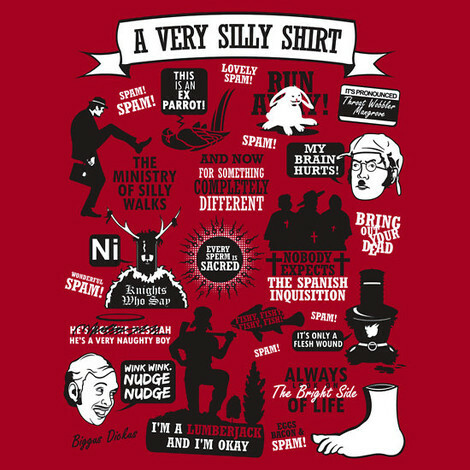 This Monty Python Quotes tee displays a collage of well-known lines from both the movies and the Monty Python and the Flying Circus sketch comedy series. John Cleese created the recurring characters in the series. This includes the Gumbies who wear handkerchiefs on their heads, have small moustaches, and hold their arms in ape-like positions. This quotes mashup Monty Python t-shirt is filled with enough movie and Flying Circus skit elements that it will surely please any fan. Pay tribute to the classic British TV show. In addition to the Monty Python Quotes tee above, browse the Monty Python Clothing Gallery for more apparel like men's and women's clothes, kids shirts or hoodies.